3D1X1, Client Systems AFSC was officially established on November 1, 2009. This AFSC was created by converting AFSC 2E2X1. Client Systems personnel are the Air Force computer networking specialists. 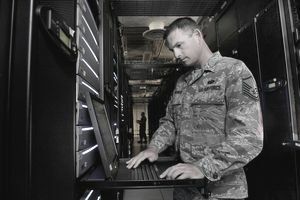 Client Systems personnel deploy, sustain, troubleshoot, and repair standard voice, data, video network, and cryptographic client devices in fixed and deployed environments. They sustain and operate systems through effective troubleshooting, repair, and system performance analysis. They also manage client user accounts and organizational client device accounts. Manages hardware and software. Performs configuration, management, and troubleshooting. Removes and replaces components and peripherals to restore system operation. Installs and configures software operating systems and applications. Provides service to end-users for operation, restoration, and configuration of information systems. Reports security incidents and executes corrective security procedures. Performs configuration, management to include adds, moves, changes, and troubleshooting. Plans, schedules, and implements installation and maintenance functions associated with voice systems. Removes and replaces telephone instruments. Reports security incidents and executes corrective security procedures. Manages hardware, software, and Controlled Cryptographic Items (CCI). Performs configuration management and troubleshooting. Plans, schedules, and implements installation and maintenance functions associated with PWCS. Removes and replaces components and peripherals to restore system operation. Reports security incidents and executes corrective security procedures. Reports spectrum interference incidents. Establishes work standards, methods, and controls for preventative, scheduled, and unscheduled maintenance actions. Determines extent and economy of repair of malfunctioning equipment. Ensures compliance with technical data, instructions, and work standards. Develops and enforces safety standards. Interprets malfunctions and prescribes corrective action. Serves on, or directs inspection teams organized to evaluate base or command sustainment programs. Manages, or performs, research and development projects for assigned systems. Coordinates and documents repairs. Manages, administers, controls, and evaluates contracts. Course # E3ABR3D131 01AA, Client Systems Specialist Course at Keesler AFB, MS - length unknown. After tech school, individuals report to their permanent duty assignment, where they are entered into 5-level (technician) upgrade training. This training is a combination of on-the-job task certification, and enrollment in a correspondence course called a Career Development Course (CDC). Once the airman's trainer(s) have certified that they are qualified to perform all tasks related to that assignment, and once they complete the CDC, including the final closed-book written test, they are upgraded to the 5-skill level, and are considered to be "certified" to perform their job with minimal supervision. of Senior Master Sergeant, personnel convert to AFSC 3D190, Cyber Operations Superintendent. 3D190 personnel provide direct supervision and management to personnel in AFSCs 3D1X1, 3D1X2, 3D1X3, 3D1X4, 3D1X5, 3D1X6, and 3D0X7. A 9-level can expect to fill positions such as flight chief, superintendent, and various staff NCOIC jobs. Virtually any Air Force Base. Additional courses in business, mathematics, computer science, or information technologies is desirable. The ability to obtain a government drivers license is mandatory.